Sophie the Giraffe So’Pure Teething Ring. The first teething ring made of 100% natural rubber. 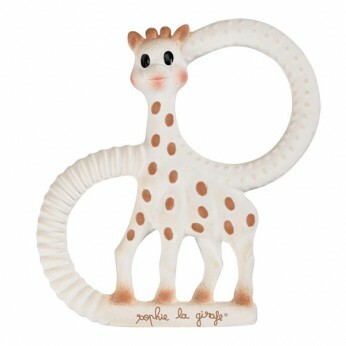 Made from the same natural rubber and food grade paints as the original Sophie la girafe. Great for little hands to hold and ideal for soothing painful gums. Features a variety of textures to relieve baby at different stages of teething. Comes in a beautiful gift box tied with ribbon – the perfect gift! This toy costs approximately £8.99 (for the latest and best prices make sure you check our retailer list for the Sophie the Giraffe So Pure Teether above). In our review of Sophie the Giraffe So Pure Teether we classed it as being suitable for ages 0 to 11 months but recommend you check the manufacturer specific advice before purchasing.